What settings can I control for SpatialVideo? Information about controlling the frame rate, video resolution, and audio settings in SpatialVideo. When adding SpatialVideo fields to your Fulcrum app, there are a number of settings available to be aware of to optimize your collection process. 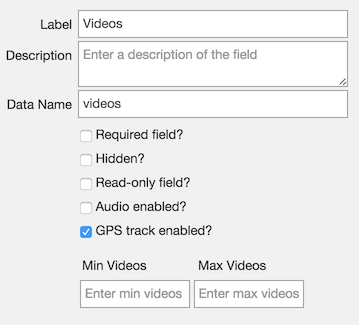 From within the App Designer, you can control whether your video field also records the GPS track line and audio. If you disable audio, it’ll record video with silence (useful if audio is not required). You’ll want to make sure audio is enabled if you plan on recording voice notes or narration alongside your video. You can adjust the video resolution settings from the settings page within the mobile application on iOS or Android. Changing the resolution and/or frame rate allows you to control the file sizes Fulcrum will record.